Why you should never let time have her way with you. I made a huge colossal mistake this last year. I let time have her way with me. I let her creep up and pass me by without so much as a glance in her direction. I squandered the present until it became the past and I failed to let bygones be bygones. I put off too many things for the next day … or the next hour. I made “to do” lists with items that never got crossed off. I made piles of papers “for filing”, that still sit untouched in their respective “for filing” piles. And now. Now I have just as much time on my hands as I did last year. As I did last week … as I did yesterday even. But, what I don’t know is how much time I will have tomorrow … or if I will be all out. And so, as it would seem an epiphany has struck my being, I hope it strikes you as well — declare today the first day of the rest of your life and be thankful for the time you’ve been granted … I mean hey, why put off till tomorrow what you can do, enjoy, create, be today. 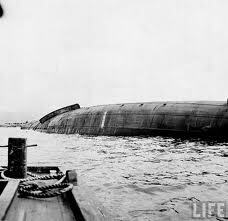 On Sunday, 7 December, 1941 when the USS Oklahoma lay capsized in Pearl Harbor, the sailors and corps men that were trapped in her hull made bets with one another as to whether they would drown or run out of oxygen first. Over the next forty-eight hours, thirty-two of those men would loose their bets as they were pulled to safety through small holes cut into the Oklahoma’s steel belly … by the end of daylight on Wednesday, their pounding and accompanying echoes halted as the hundreds of remaining men lost their lives to time’s constraints. Time. Something we should be thankful for when she grants it to us. Now go do something with it! Today’s Post inspired by The Daily Prompt — If I could Turn Back Time. Previous Can you learn something great, from someone you never met? This is BLYRO, author of children's picture book Over and Under, hopping by and following your lovely blog. i hear you! I never waste anytime, not intentionally anyways. but being pretty tough with time consuming priorities, I get frustrated when someone wastes mine. followed you back. thank you for this post, very inspiring. I too always think that I have a lot of time and put things aside.